Review of Anchor "Our Special" 2011 Christmas Ale | Beer Apprentice - Craft Beer News, Reviews, Interviews and Info. Merry Christmas everyone!!!! I hope today’s review finds you all in good company and in good spirits!!! As for the craft beer that I will be sampling today, I’m going to be sipping on a 2011 “Our Special” Christmas Ale produced by the Anchor Brewing Company located in San Francisco, California. This is a brew that I try to pick up every holiday season and each year the brewery changes the recipe slightly, so I’m wondering how this batch will be. Let’s find the description from the website, anchorbrewing.com, shall we? 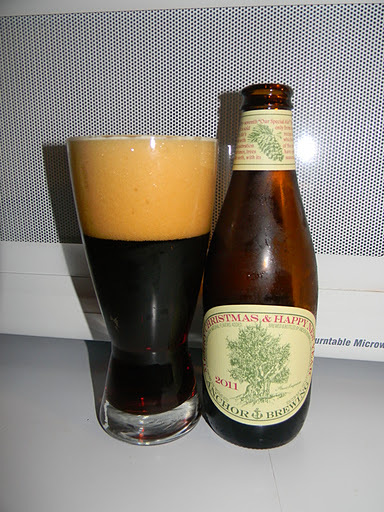 Each year since 1975, Anchor Brewing creates a distinctive Christmas Ale, available from early November to mid-January. A rich, dark spiced ale, our secret recipe is different every year—as is the tree on the label—but the intent remains the same: joy and celebration of the newness of life. Since ancient times, trees have symbolized the winter solstice when the earth, with its seasons, appears born anew. Our tree for 2011 is the bristlecone pine. Found high atop California’s White Mountains, bristlecones are among the oldest living things on the planet. Some date back nearly 5,000 years, to the dawn of the ancient art of brewing. Each year our Christmas Ale gets a unique label and a unique recipe. Although our recipes must remain a secret, many save a few bottles from year to year. Properly refrigerated, the beer remains intriguing and drinkable for years. Different nuances emerge as the flavor mellows slightly, much like the memories of great holiday seasons past. Celebrate the holidays with Anchor Christmas Ale, an Anchor tradition since 1975. This years version has an ABV of 5.5% and comes in the standard 12 oz. bottle. The beer poured a very, very deep ruby to blood red color with some brighter ruby highlights showing through when held toward a light source. A voluptuous, light tan head was formed that was very full, smooth, soft, semi-rocky and creamy. The retention time was spot on the lacing looked pretty good too. The aroma on this brew provided a very subdued and relaxed spice note of cinnamon, ginger and nutmeg. It seemed to have a considerable malt backbone. Light hints of chocolate with an herbal tone and dark breadiness for good measure. A tiny fragrance of mint and pine completed this well balanced, but otherwise moderate smell. The taste was very reminiscent of the nose. Very tranquil, however very well balanced. No one flavor stood above the others. It was suitably piny, bready and earthy along with a minute sweetness from the chocolate. The spices were hiding in there somewhere as I gradually was able to find the ginger, nutmeg and cinnamon. As I neared the end of the drink I began to gather savors of some burnt grain, which reminded me somewhat of a Bock styled beer. Overall, not much bitterness was to be found, but still a decent taste on this years version. The mouthfeel was medium to thin bodied. It was quite smooth and crisp, although quite a bit watery also. I wasn’t expecting that. As the brew slid across the palate not much flavor was left behind for me to enjoy. It vanished fairly quickly. This years Christmas Ale from Anchor was just “ok” for me. Nothing outstanding I didn’t think. I seem to recall this brew being a little more robust and forthcoming in years past. Oh well, it was still easy to drink and worth picking up if you are making your way through all of the seasons Christmas beers. I’m going to save a bottle or two of this to try again next year and compare it to the 2012 version. That way I should be able to pick out some of the subtle differences. Thanks for reading and commenting folks. I want to wish everyone a very happy and safe Christmas Day.